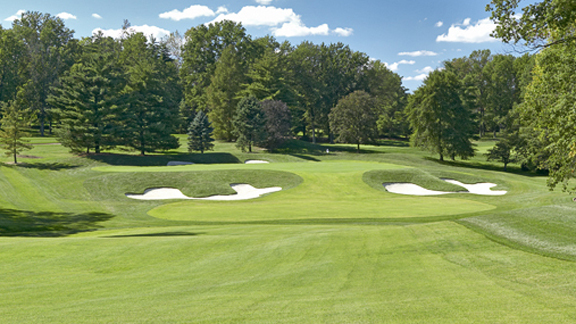 The 100th PGA Championship will be played this coming weekend at the Bellerive Country Club in St. Louis, Mo. Missouri. August. Maybe the best reason why the PGA is being moved to May beginning next year. Bellerive has hosted a major championship only two times before. In 1965 Gary Player won the U.S. Open to become the 3rd player to win the career slam, following Gene Sarazen and Ben Hogan. In 1992, Nick Price won the first PGA played here. The 7,329-yard par-70 course is built around a creek that winds through the grounds. Water comes into play on eleven holes. The championship course normally plays at 7,547 yards par 71, but 54 yards were shaved off the par-5 4th hole, turning it into a 521-yard par 4. The 10th green is shown below. The PGA lacks an obvious identity the other major championships possess. The Masters has a fine course everyone recognizes. The U.S. Open takes a difficult course and turns it into an impossible one. The Open Championship takes a fine course and lets it stand on its own, which it never fails to do. But the PGA? Its identity is subtle. It has the finest field of the four majors, club pros notwithstanding. Winning it is difficult because there are so many players in the field who are capable of winning. So who are my picks? Justin Thomas can repeat. Tommy Fleetwood is due. Xander Schauffele plays well in majors. Jordan Spieth needs this one to win the career slam. Dustin Johnson hasn’t gone away. What this tournament means to me is this. Starting next year, golf ends in July with the Open Championship. I’ll just take a break from sports for a few weeks afterward nd then get ready for college football without my attention being divided.